Pola Orbis Holdings, a group that conducts cosmetics-related and other business, runs the Pola Museum Annex gallery in Ginza that is free for visitors. The gallery has featured many ambitious exhibits such as an Orie Ichihashi photo exhibition and an exhibition of original drawings by Asami Kiyokawa. In the 8th part of the Ginza×CSR series, we spoke with Mikiko Matsumoto who manages projects for the gallery. Matsumoto talks about the ideal state for cultural activities that enrich our hearts through the arts. ─ The gallery is located on the third floor of Pola the Beauty Ginza, Pola’s flagship store located on Ginza Chuo-dori that has a beauty salon, provides beauty counseling and sells cosmetics. The Pola Ginza Building was renovated in fall 2009 to celebrate the 80th anniversary of Pola’s founding. At the same time, the Pola Museum Annex was opened as a base for disseminating art and culture information. It was made into a genuine art facility with special lighting and fire extinguishing equipment designed for art museums. Fire safety standards for art museums require installation of nitrogen gas fire extinguishing equipment. This is because, if a fire should happen to break out, a sprinkler system would ruin the art pieces. ─ What criteria do you use to select artists and art work? We choose various genres from paintings to photographic pieces. The concept is that the gallery is an extension of the Pola Museum of Art in Hakone, and we want people to casually enjoy art in Ginza, so we mostly select pieces that are not too difficult to comprehend and can be enjoyed in ordinary life. For example, the illustrator Yuko Sugimoto was an artist that created illustrations for beauty magazines. The women she drew in her works are all beautiful and stylish and have great figures. They embody the image of the ideal woman, so we held an exhibit of her works because we imagined that many people would aspire to look like them and would come to see the pictures. Actual blush and eyeshadow were applied to the illustrations that adopt exquisite coloring. ─ What value does Pola place on this type of cultural venture as a cosmetics manufacturing group? Our mission is to help women achieve their desire to be beautiful. A mental stance of valuing the arts and traditional Japanese culture as one approach to enhancing inner beauty has been rooted in Pola’s corporate culture since its founding. Creating opportunities to experience valuable art works may help foster overflowing inner beauty in women. ─ The gallery seems to strive to foster young artists. We create a venue for up-and-coming young artists returning to Japan after studying abroad to present their works. Some of them are even given employment or sell their work through this opportunity. A number of the young artists we have fostered have even ended up collaborating with us in our regular business, for example by decorating the Pola the Beauty Ginza shop show window. In addition to a platform for presenting works, we also want to provide a stage for pursuing activities. ─ Does the gallery have synergistic effects with Pola’s primary field of cosmetics business? As a collaboration project to present B.A. Grand Luxe II, one of Pola’s most high end beauty essences, we held an exhibit of original drawings from Fuyumi Soryo’s Renaissance history manga, “Cesare, The Destroyer Creator,” this fall. It was an opportunity to teach people about the novel properties of this beauty essence through the manga’s concepts of “reformation” and “defeat.” With the joint effects of the exhibit and a building wrap advertisement, the volume of visitors increased by about 1.5 times the average. Usually, only a limited class of people learns about our more expensive cosmetics products. By using a mainstream creation with a common world view, however, we can increase recognition of our products among a wider range of customers. Moreover, customers that came for the gallery are also attracted to the beauty shop on the first floor. In addition to being a social contribution project, I also want the gallery to lead into opportunities for regular business. ─ You also utilize the location of being along Ginza’s main street. Every June and November that are cervical cancer awareness months, we create an illuminated ribbon symbol with LED panels on the entire face of the building that houses the gallery. This project is linked to donation efforts as part of the Teal & White Ribbon Project aimed at raising awareness for cervical cancer. Pola offers a “skin check” skin analysis service. During the project period, it gives a donation each time the service is used. ─ How did these donation efforts start? Pola carries out activities to support a lifestyle that allows women to shine, called the Anti-Aging Alliance (AAA). The AAA also encourages social contribution activities. A Pola employee in Osaka then wondered if there was some way to contribute to society through regular work activities, and began donation efforts to match the number of skin checks. This project has now expanded to the rest of the Group. As of the end of 2012, we had reached a total of about 14.5 million yen in donations. ─ How is running the gallery positioned among Pola’s CSR activities? Experiencing beauty and protecting traditional culture has been rooted in Pola’s corporate culture since before the phrase “CSR” appeared. We do not run the gallery or carry out donation efforts for the goal of “CSR.” These activities are simply an extension of what Pola has been doing for a long time, since its very establishment, or are the natural manifestation of our employee’s attitudes. ─ So, the corporate philosophy has spread throughout the Group’s employees? For social contribution activities, Pola values the spontaneous ideas of its employees at each of the Group’s companies and forms cooperations. We hope to give shape to the roles of each employee based on the natural spirit existing within our corporate culture. 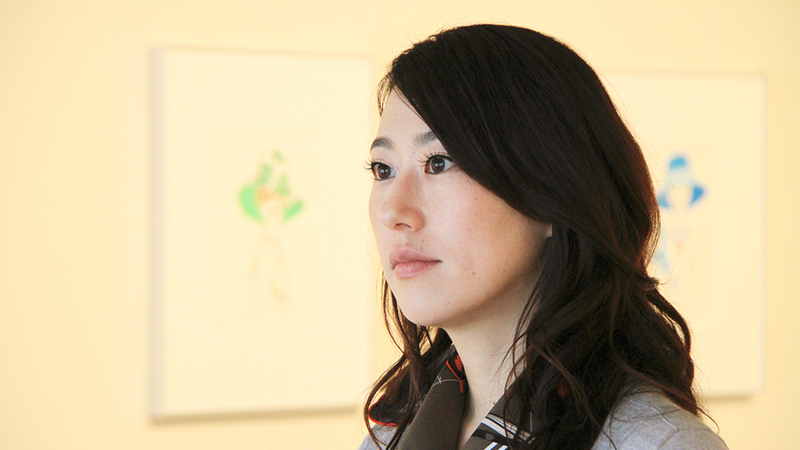 ─ What is the appeal of running a gallery in Ginza? As a place that is visited by many people from foreign countries, Ginza is an important base from spreading information that allows us to further our internationalization. It is important to convey the culture and attitudes of the company, so the gallery plays a major role. In addition, there are many fabulous ladies in Ginza that are highly sensitive to information, so we hope to continue holding exhibitions that resonate with them. Director of the Pola Museum Annex, Public Affairs & IR Dept., Pola Orbis Holdings, Inc.
After graduating from university, began working as a curator’s assistant at an art museum in Tokyo. In 2002, took on motor show display work centered on green vehicles for a research institute of the Ministry of Land, Infrastructure, Transport and Tourism, then joined the Pola Cosmetics Inc. (currently Pola, Inc.) main shop in 2006. Worked on gallery opening preparations for the Pola Ginza Building renovation in 2009.